In the previous episode of this series about how to develop a Windows Phone application from scratch we used IsolatedStorage to persist some data. 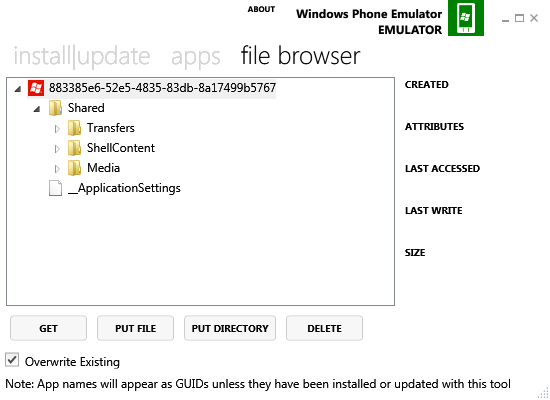 Since IsolatedStorage is a file store on a Windows Phone device, for exclusive use by a single application, it can be a challenge to look at its contents. Luckily, the Windows Phone 7.1 SDK has a tool available to explore IsolatedStorage contents. In this episode of EvenTiles we will explore this Isolated Storage Explorer Tool. In order to retrieve our ApplicationSettings from IsolatedStorage for EvenTiles, the first thing we need to know is the ProductID for our application. This ide can be found in the WMAppManifest.xml file. the folder C:\iso will contain a snapshot of our application’s IsolatedStorage. 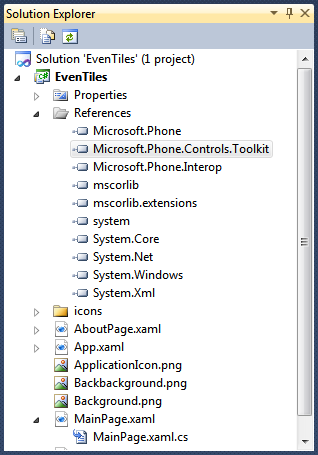 When we drag and drop the _ApplicationSettings file to Visual Studio 2010, you can see that its contents are XML data, representing a Dictionary with one single entry defined in it, matching our Secondary Tile’s back side string. You might not like using a command line tool to explorer IsolatedStorage. In that case, there is good news for you. 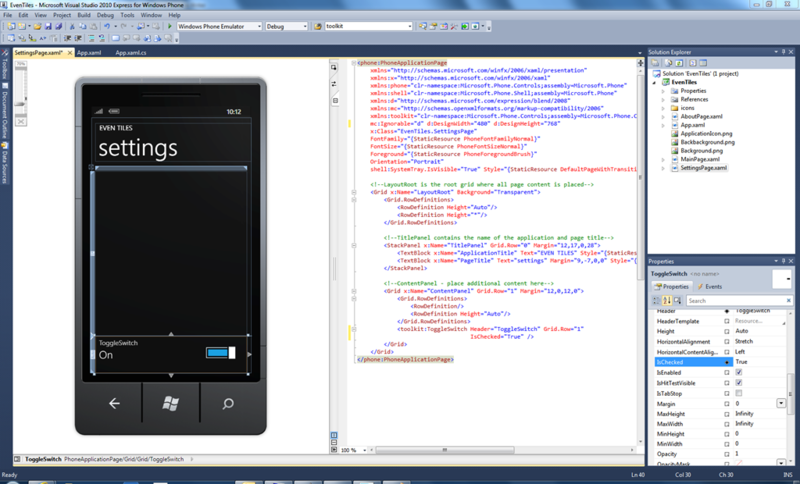 If you browse to http://wptools.codeplex.com/, you will find the Windows Phone Power Tools for download. This handy collection of tools embeds the different SDK tools including the Isolated Storage Explorer Tool inside a Windows application. With that application you can explore your application’s IsolatedStorage as well. Using the power tool, it is also easy to write new or modified files to your application’s IsolatedStorage. The latter makes a lot of sense if you want to test new versions of applications against old contents in IsolatedStorage, for instance to migrate old files to new versions. 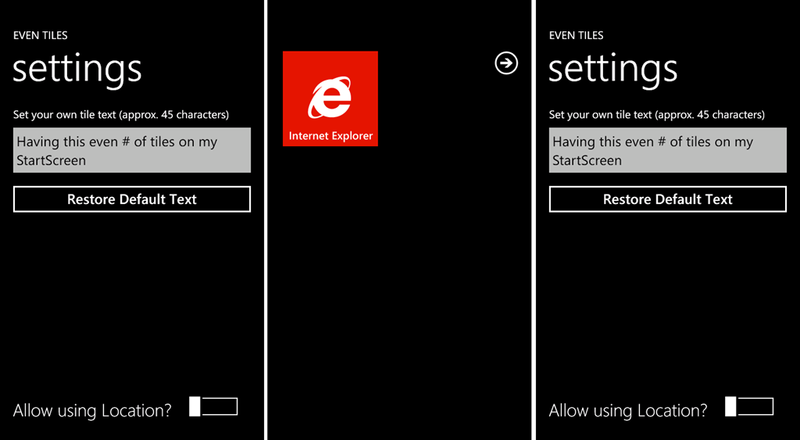 The following video shows the Isolated Storage Explorer Tool and the Windows Phone Power Tools in action. So this time we did not add functionality to our EvenTiles application, but it is important to learn about useful tools to help us develop our applications as well. In the next episode we will talk about Tombstoning and Fast Application switching and what we need to do in our application to support these two important execution states on Windows Phone devices. simple reordering possibilities for application bar icons en menu items. 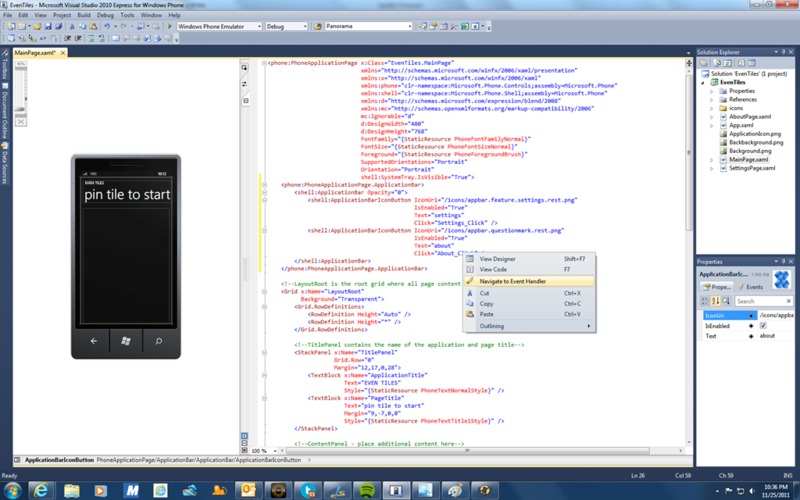 Visual Studio can work closely together with Expression Blend. 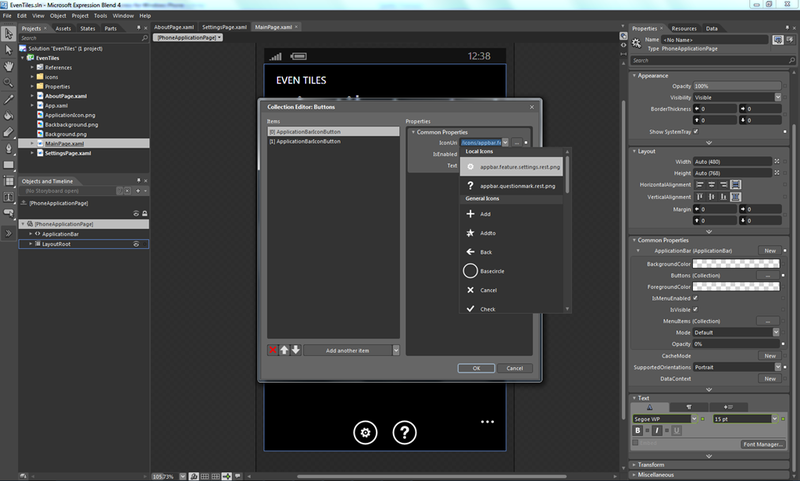 Changes in one environment will be visible in the other environment (usually changed files must only be saved or a project must be rebuilt in order to achieve this). 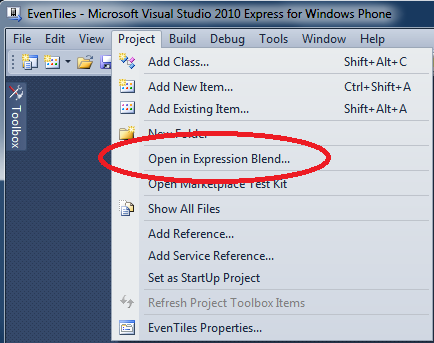 If a solution is already open in Visual Studio, you can start Expression Blend from within the Project Menu as shown. 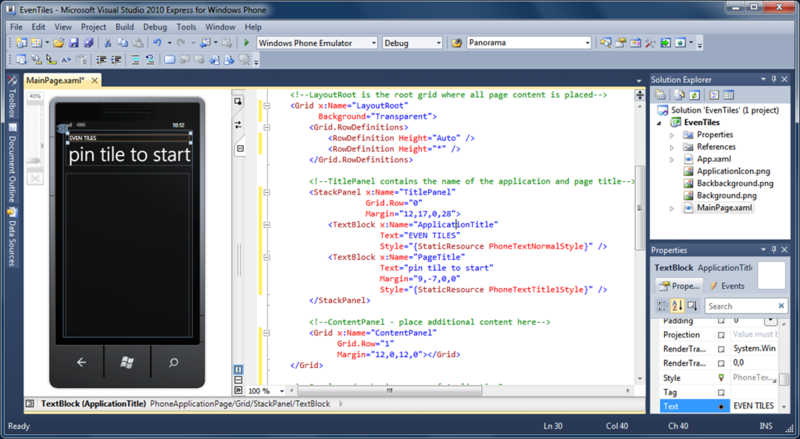 Even though you can use Expression Blend to add code to your Windows Phone pages, you probably want to limit doing so, since you don’t have Intellisense available, which is one of the great features of Visual Studio that really makes entering code easy. You can immediately see that you are in a different environment when looking at Expression Blend. 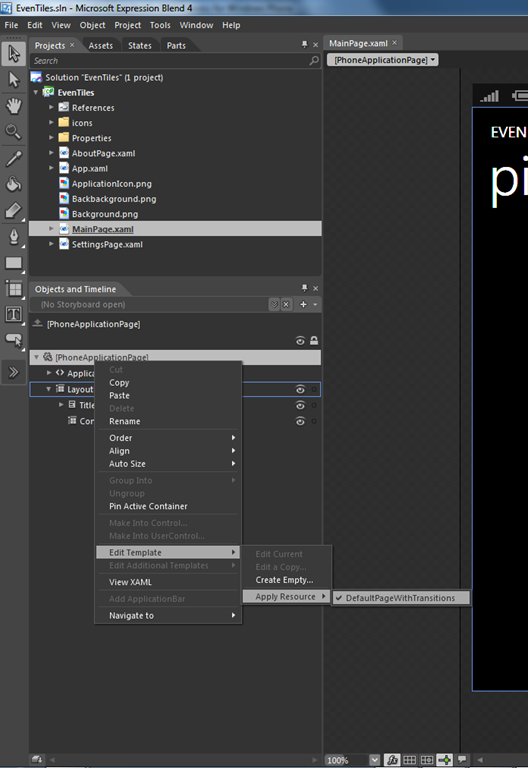 Its default theme color is dark. Something else that is immediately noticeable is the large amount of windows, options and choices available inside Expression Blend. It surely will take you some time to feel comfortable in this powerful design tool. 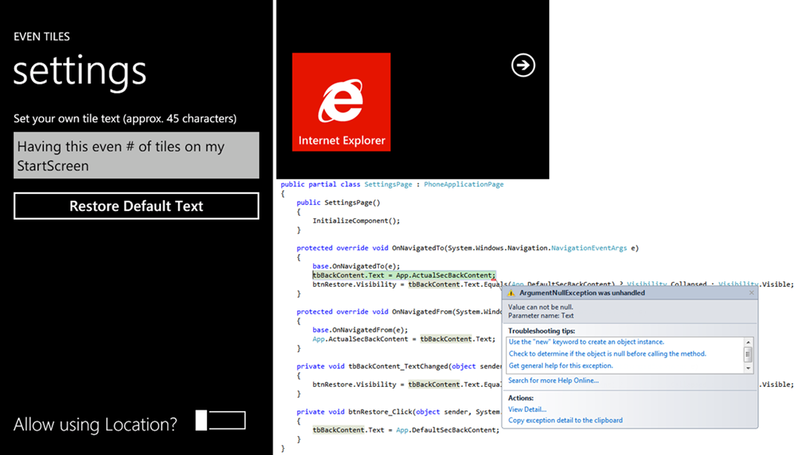 To add code to the Click event handers, we are using the C# code behind file, belonging to the MainPage. 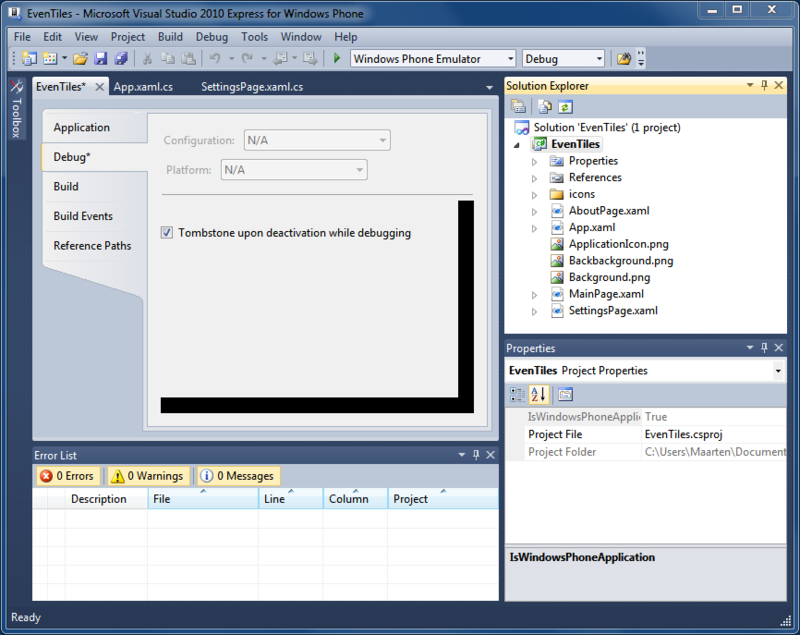 To create entries in the code behind file for both Click event handlers (and in that way connecting XAML to code), you can right click on the event handler in XAML and selecting Navigate to Event Handler entry from the shown popup menu. The code in the event handlers is very simple, using the NavigationService to navigate to another page by providing a Uri that contains the page name. LiveTiles will be extended soon. In the next episode we will take a look at the Silverlight toolkit, Page Transitions and additional controls that are available in the Silverlight toolkit. 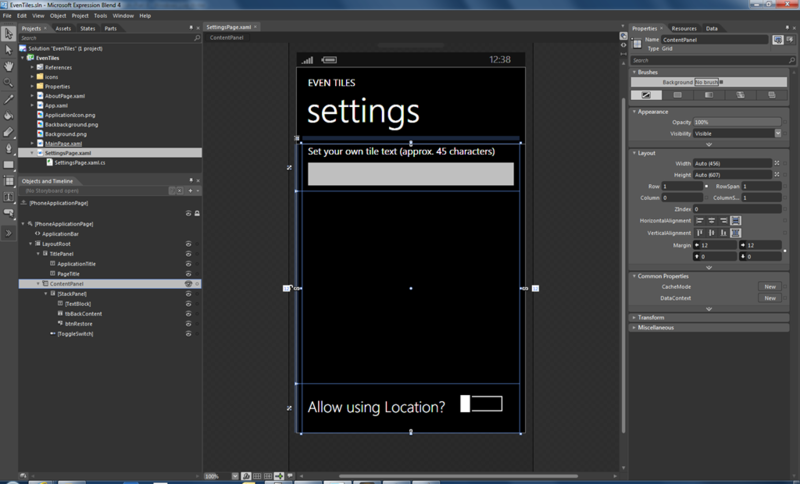 Make sure to lookout for part three in this series about Windows Phone application development.